Just can't seem to get enough of the glamping idea? Me neither, especially in the winter! 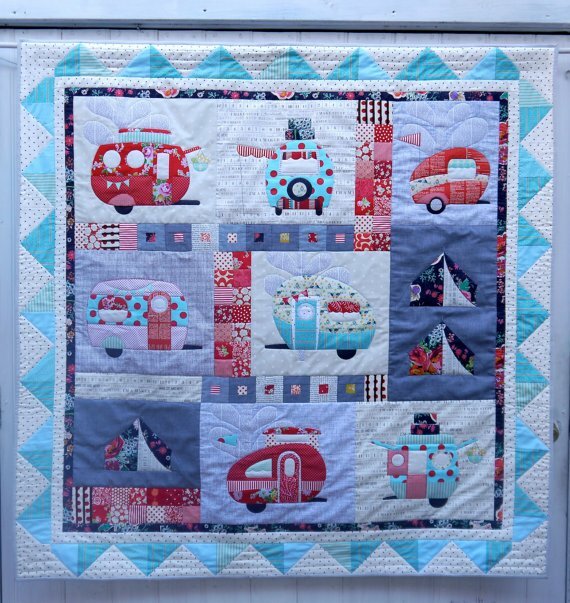 "Vantastic" is one of those quilts that just calls to you. I've been trying to run away from it, but this one finally caught me. Piecing quilts are great, but applique quilts are way more fun! This is a 62" square quilt with seven different vans and a few funky tents. This quilt is great for the beginners and advanced quilters alike for one main reason: it's so stinking' cute! The pattern comes with real-sized pattern templates that are ready to scan into your cutting machine at home. In class, we will be putting our appliqués together and stitching them down. This is a party waiting to happen! !